When life becomes stuck—and then unstuck | Where to next? A couple of weeks back someone on the truck said—out loud—that we hadn’t had a flat tyre yet. The big ‘Bang’ came about five minutes later as Suse inched the truck down a steep, rocky road to a likely camping spot beside a reservoir. The huge blowout produced an enormous gash in the side of the tyre. So while the cook group got on with making dinner, some others got on with changing the tyre. These things aren’t easy. It takes about four people to lift and manoeuver a single tyre and at least 30 minutes to get the job done. And there’s some important follow-up down the road, literally. About 100 kilometres on, it’s an important safety precaution to check and tighten all the wheel nuts. Suse and Quinn did that job the next day. As far as truck hiccups go, that was the first major one UNTIL a couple of days ago when someone else said almost out loud—I heard it and I have not dobbed in this person for fear it will come back to bite me on the bum—that we hadn’t been bogged yet. 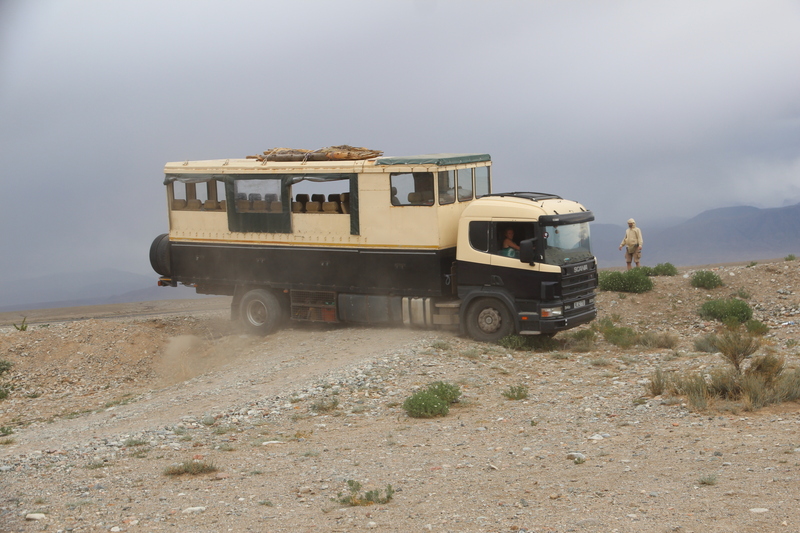 The big ‘kerthunk’ came about five minutes later as Suse turned the truck down a narrow track to another likely camping spot. 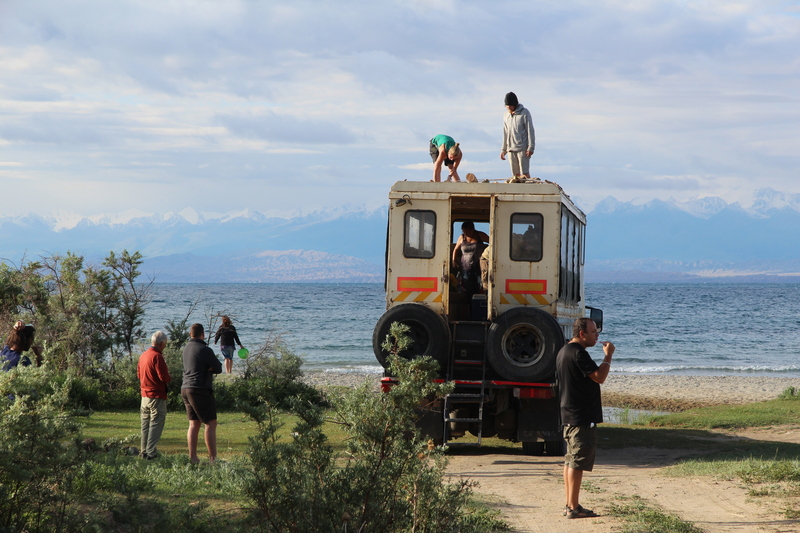 This time by the scenic Issyk-Kul Lake. A bit of ground gave way on the right and we were stuck. Not a little stuck, but really, really stuck. The photos don’t really show how precarious the situation was. Suse couldn’t go forward or the truck would be high-centred or, even worse, tipped on its side. Even with a lot of us (not me, I photograph) doing a lot of digging, she still couldn’t get enough traction to go in reverse either. This is when every passing male felt the urge to stop and offer advice. They saw a woman driver and assumed all was lost without their assistance. They stood around with arms folded across their chests. Unless they were spouting instructions, they kept their lips pursed. My dear friend, Maggie, calls this look ‘lips like string’. She hauled him out pretty darn quick, which was a relief, because so many people were around the truck that someone would probably have been seriously hurt if he’d tried to drive forward or back. In the end, Talbot and Suse devised a brilliant plan. 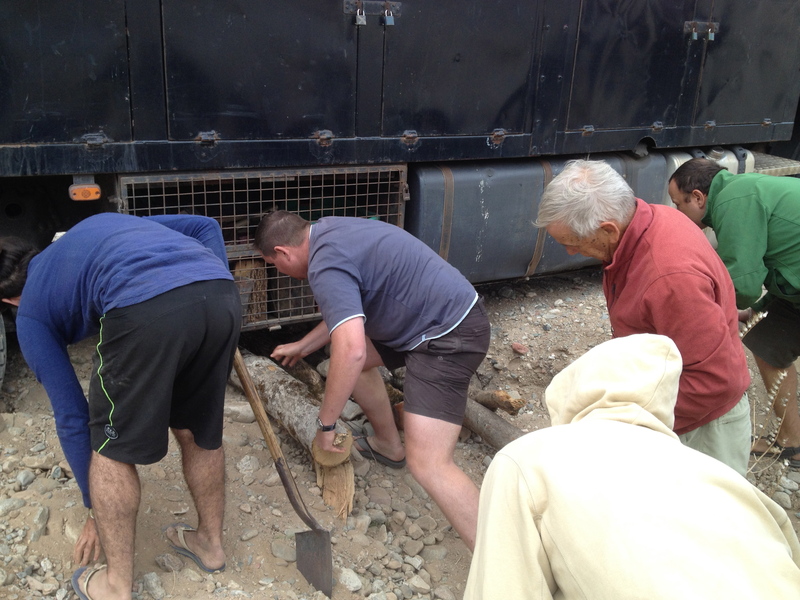 Firewood was brought down from the roof of the truck and used, along with tons of stones we carried from nearby, to fill in the gaps that posed the greatest risks. After maybe an hour of labour, Suse deemed our handiwork satisfactory and drove successfully over the stone and timber bridge we had created. As for the prophet of doom who caused all this? Well, I’ll never tell. where did all the blokes with the advice go ? All the fellows who stopped to help/advise drove off without waiting to see whether we got out. And Suse does fit the bill inthe trust department. Reminds me of when I got bogged near a waterfall on the Atherton Tablelands last year. 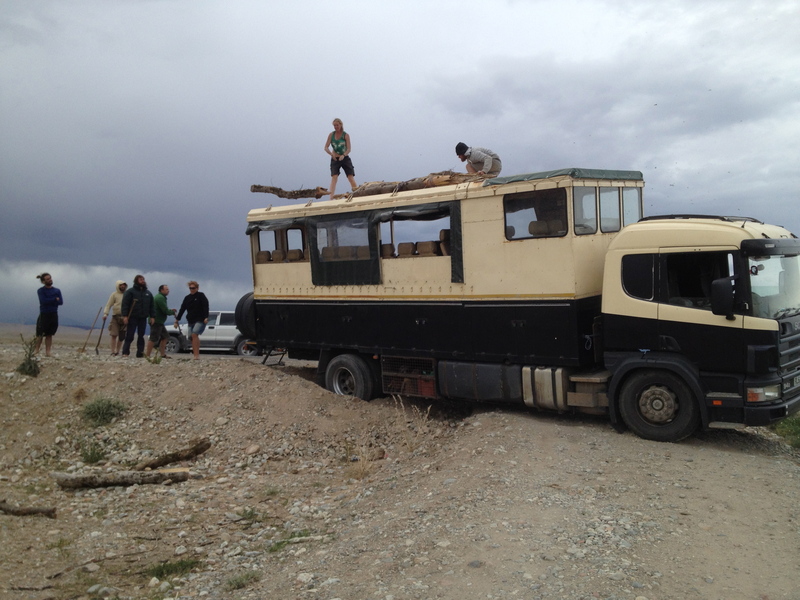 Kombi van pulled up with international students and, boys being boys, they all knew how to fix the problem. Girls being girls, and slightly more rational, said that they couldn’t do it that way. Eventually one of the young women, from Sweden I think, hopped in and got the car unstuck. The boys didn’t say anything then either. Really pleased that you got your tyre fixed and the truck unstuck. Might I suggest that no one, no matter how well intentioned, utters the words ‘Isn’t it lucky that insert potential hiccough here’ hasn’t happened to us? Good advice Louise. We’ve already put a ban on the phrase ‘isn’t it lucky’. Very glad the Swedish girl came to the rescue. Obviously a good thinker. 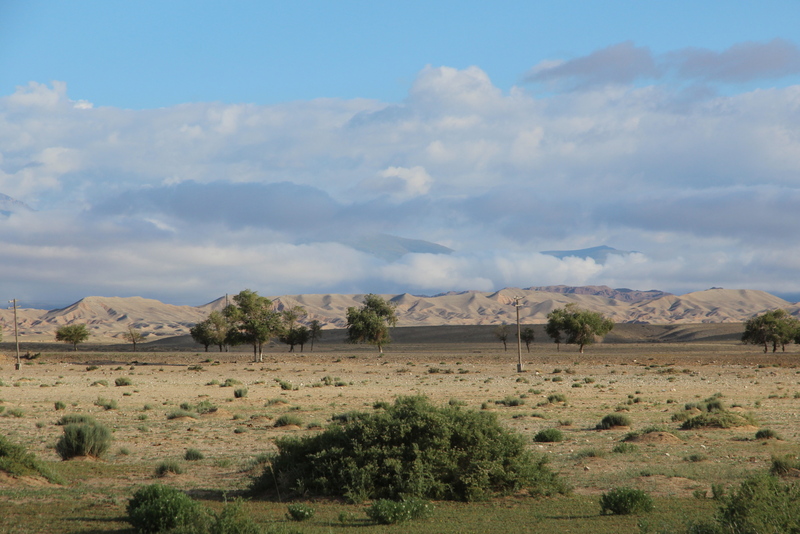 It reminds me, also, when I got stuck about 100 miles north of Coober Pedy. But it’s always fun in retrospect. Amazing how you just get on with things even if you get stuck. I think Coober Pedy is a trap waiting to happen. My mate and I were stuck for two days. And nobody drove past. It was 45 years ago. Someone has to be truck photographer.